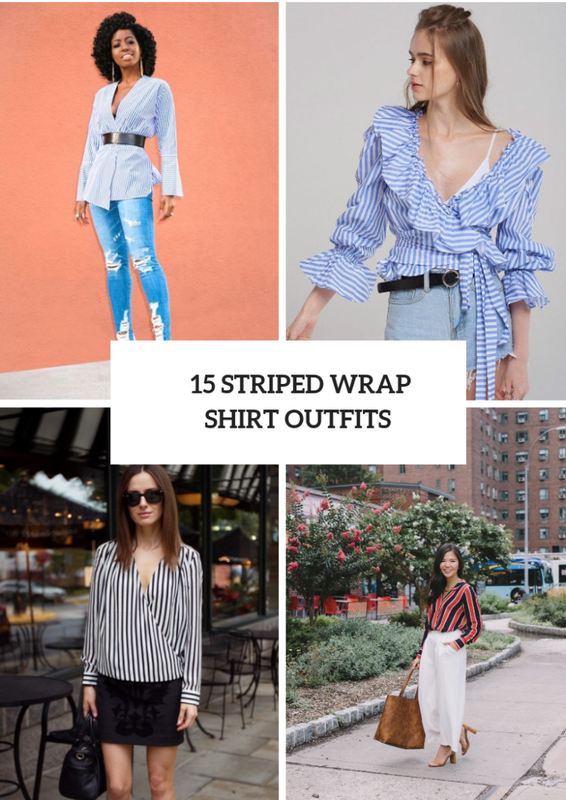 I’m sure you already have a striped shirt (cause every fashionista should have it), but what about a striped wrap shirt? From my point of view, this type of blouses is very comfy and easy to combine with other pieces of clothes and accessories, so you need to get it as soon as possible. 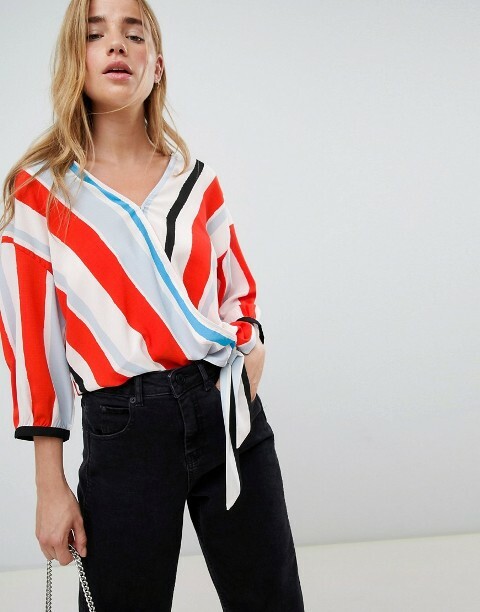 If you love classic items, then you can choose black and white or navy blue and white striped shirts, but if you wanna something unique and creative then you should pick up blouses with colorful stripes and eye-catching color combinations. As usual we have collected several look ideas with such wrapped shirts, so scroll down and enjoy! 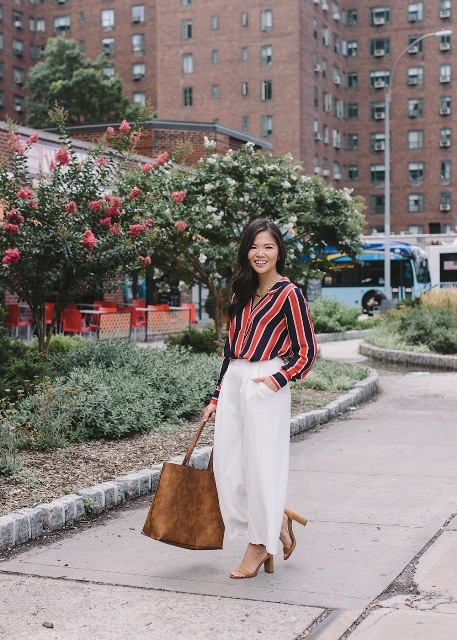 For summer days you can choose white pants, they look fresh and elegant. 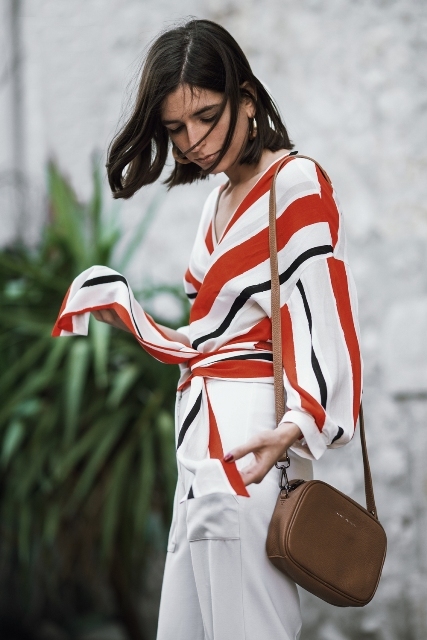 For example, you can take white culottes and mix them with a navy blue and red striped wrapped loose shirt, a brown leather tote bag and beige sandals. 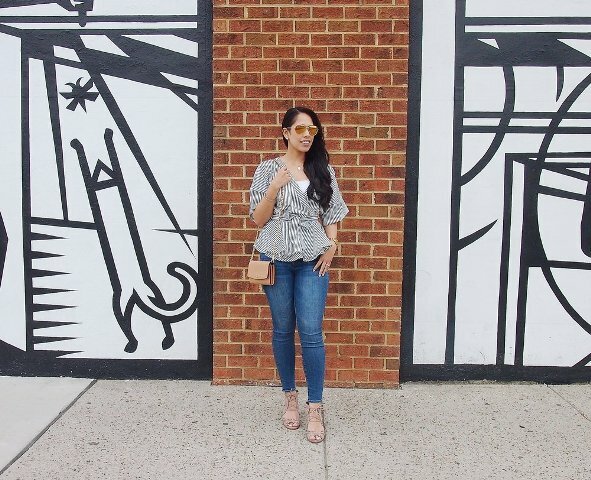 Or you can choose white distressed jeans and pair them with a blue and white striped wrap off the shoulder blouse, oversized sunglasses and a white chain strap bag. 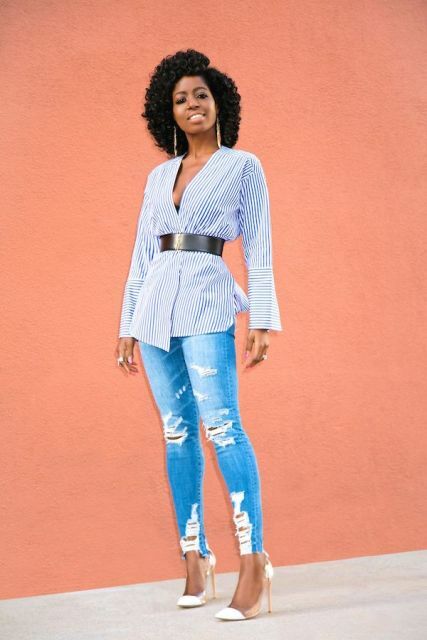 If you love to wear jeans, then try to repeat a look with skinny jeans, a white top, a black and white striped wrap long shirt, a beige small bag and beige shoes. Don’t forget about shorts, cause you can create a cool outfit with them. 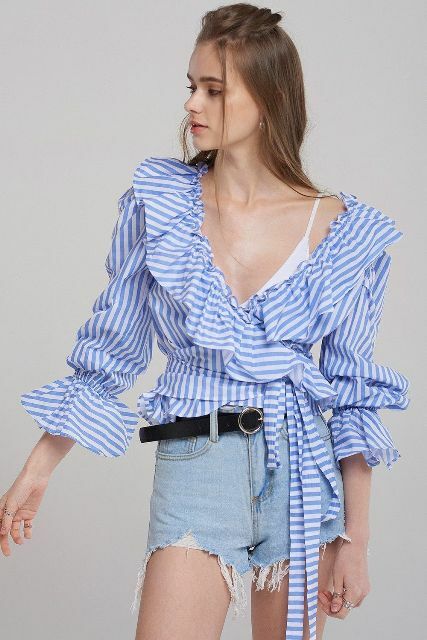 Take denim ones and combine them with a white top, a blue and white striped ruffled blouse and a black belt. 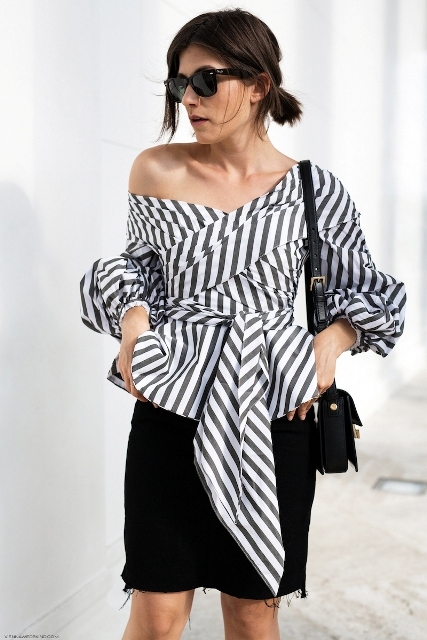 If you like bold combinations, then you can mix a black and white striped wrap shirt with a black and white striped wrap midi skirt and black ankle strap shoes. 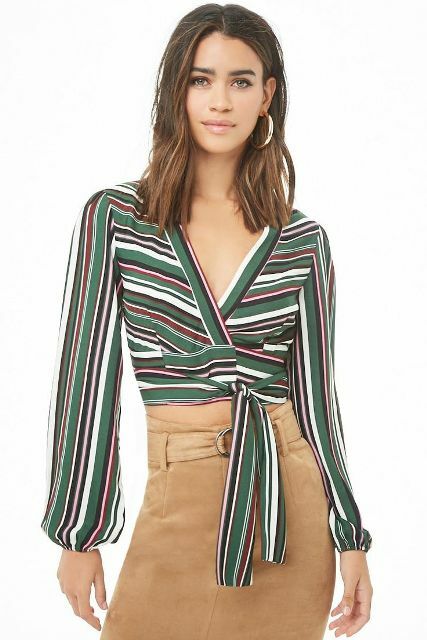 But for those who want to make a more official look, I offer to take a loose striped long sleeved blouse and pair it with a black mini skirt, sunglasses and a black leather bag.